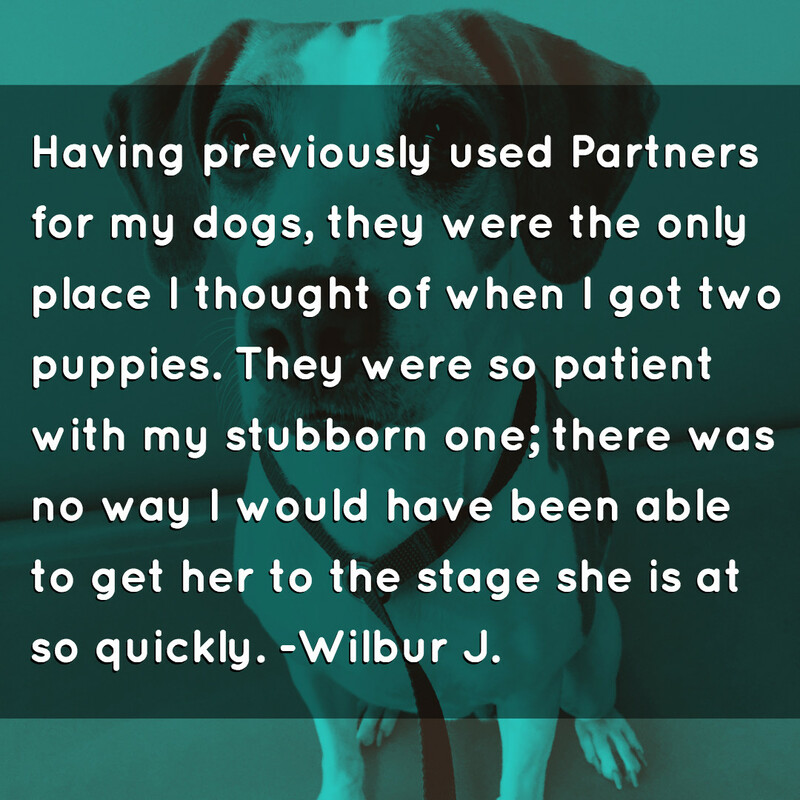 why choose group Classes at Partners Dog Training? Partners Dog Training has been running group classes for over 20 years. We have trained over 35,000 dogs in that time. We know a thing or two because we’ve seen a thing or two. Partners Dog Training has dog group classes for all interests, experience levels, and schedules! With over a dozen group classes run each week, you’re sure to find something you’ll love. The outside world has a plethora of distractions that may be hard to control. Let us help. Partners Group Classes give you the opportunity to work around distractions under the guidance of professional trainers. The goal of Partners Group Classes is to keep you training. The more practice you get the more progress you’ll see. Every time you attend Partners Group Classes you’ll see improvement on some level. We are known as “Balanced Trainers.” Meaning we lean very heavily to reward-based training, but also believe in telling a dog “no’ for doing something naughty. We will teach you how to correct any unwanted behaviors and whip that obedience into shape! We offer puppy group classes to help you build a great foundation with your puppy. You then have a variety of advanced obedience classes to keep you and your dog challenged and continually learning throughout your lives together. READY TO join partners group classes?! Introduction to basic obedience behaviors. A must have for puppies 5 months to 8 months old. This class is a great stepping stone for the younger puppies to go into more formal obedience. There are two instructors in this class; one main instructor who gives explanations for different behaviors and the assistant. This class breaks up for more individual time for the clients and instructors to work one on one with the dog and handler teams. This class is 4 weeks and is $229 for the class. For any questions, class dates, and pricing please call 480.595.6700, or email bark@partnersdogs.com. This class is for dogs from 20 weeks and older, who have no behavioral issues. This class does not feature any type of direct socialization, however, dogs do learn to work side by side with other dogs without becoming overly distracted. This class spends a great deal of time educating the owner on basic training technique such as timing and marking, as well as trouble shooting. There are two instructors in this class; one is a lead instructor who calls commands and gives explanations to the training, and another instructor to help individually whenever possible. Dogs can test out of Level One with a level evaluation, which is $50. This class is 8 weeks long. As well as introduction to off-leash. This is a fast paced class with tons of new and fun behaviors! There is one instructor for this course, they will call commands as well as break down and help individually when possible. In this level of obedience, we assume that the handlers have a decent handle on their dogs and can manage learning the new behaviors while keeping their dogs under control. This class is a feeder class; dogs come in from Camp, Level One, as well as Private Lessons. Initially the skill sets of the dogs are different, however, after the first one or two classes the skill sets level out as everyone is learning new material. This class is 8-weeks long. Level Three is where we perfect the advanced behaviors learned in Level 2, and learn a few more commands as well. This class prepares dogs to move towards off-leash and distance work, however, it is not necessarily off-leash. This class will be repeated until the dog is able to be trusted 100% off-leash. Level Three has one instructor and is an 8-week course. For any questions, scheduling, and pricing please call 480.595.6700, or email us at bark@partnersdogs.com. The vast majority of the class will be off leash. This class is designed to be more difficult and distraction rich. It is the goal of the instructor to switch things up throughout the class to make it fun and challenging for both the handler and dog. Level Four has one instructor and is an 8 week course. One of the best classes that we offer at Partners is Out & About! It is the epitome of obedience and will build a bond with you and your pup like none other. The requirements for this class are that the dog has completed Level 4 Obedience, tested and passed the AKC Canine Good Citizen test, and has instructor approval. This class meets here at Partners every other week for a Level 4 style class, and then in an out location such as Desert Ridge, Scottsdale Quarter, and Sundial. Out & About gives you the opportunity to practice obedience in the real world alongside instructors that can help you through any obstacle that may arise. This class has two instructors; a lead instructor who leads the way and calls commands, and an assistant who is there to help out! It is an 8 week course. One of the most fun ways to get excercise with your pup! There will be one competition-level instructor and one assistant to help out! Rally is one of the most rewarding classes we offer as it focuses on the perfection of basic obedience skills. Be prepared to have your dog sit or down straighter than ever. Walk while watching you, and much much more! Rally teaches your dog and you to be a team. Rally is a competitive sport but you don’t need to compete. Rally practices different obedience skills at individual stations on a course. People in Rally should know at least Level 2 Obedience. “Attending the included classes has taught me, as well as the dog, and aided me in teaching my other pet at home on our own time schedule. The instruction is quite structured and makes sense helping us both understand the reasons for the commands and the proper responses.” Marshall M.
What if a miss a group class? In some cases, you are allowed to join another class going on at that time. However, this is all up to your instructor’s discretion, and is taken on a case-by-case basis. Classes typically run 8 weeks long. However, our Puppy & Me class is only 4 weeks long. How many dogs in a group class? We keep all group classes at Partners Dog Training to under 8 people in order to give you the attention and experience you deserve. Will group classes cover behavioral Issues? No. Group classes are set up to cover obedience. If you’re experiencing any problem behaviors we recommend one of our Board & Train Camp programs to reach success. Classes typically run about an hour long. However, we recommend at least 5-10 minutes early to give you and your dog time to settle in before starting training. There is also time after class to ask the instructor any questions. We have several locations for Partners Group Classes. Most classes are held on the main training field. However, we try and hold as many classes indoors during the summer months as possible.